Inktonerstore has been serving customers with premium quality printer supplies since 2009. Our goal is to provide good quality ink and toner cartridges at the lowest price while offering the best shopping experience. We have a large selection of printer ink and toner cartridges and our products are rigorously tested to ensure that customers receive the best quality products for their printing needs. 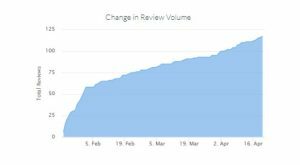 As shown in the change in review volume a consistent upward trend to a significant 117 reviews in the second week of April. 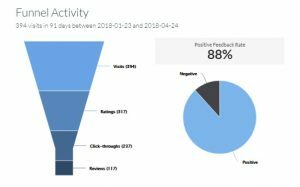 In fact, review traffic reached 1,686 review count overall with 88% positive feedback at 4.9 STAR RATING since the start of our Reputation Management campaign. You can see the results how effective review campaigns are. The conversion rate of the campaign is more or less 30% which leaves the 70% of review site visits as an opportunity for potential conversion. Our strategy involved crafting of the newsletter, implementing the use of proper content with top-notched design, running email campaigns and building the brand. In terms of building the company’s brand, we maximize the customer’s website functions, such as adding a dedicated review page, with its own dashboard and installing a multi-channel review widget. We first build your brand by managing how online users who find you via search first to perceive your company’s reputation. We provide customers with review request card which promotes customer reward and at the same time serves as an invitation for a customer review. Copyright © 2019 Easy4Host Inc All Rights Reserved.